They say ‘all things old are new again’, and in the world of hi-fi it couldn’t be any more true. Music enthusiasts are dusting off their old record collections and choosing to return to more classic days. Hi-fi manufacturers offer an amazing array of high quality turntables - the theory is the same, but you have to see and hear how science and technology have taken the art of record collecting to the forefront of the modern hi-fi experience. 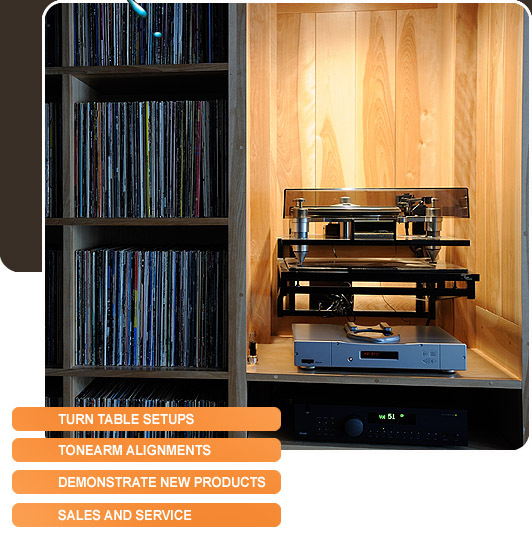 Call me for a chat on how your vinyl collection can sing! Whether you need a new cartridge or a complete new turntable, I can supply it. I will assess your current setup, do cartridge installations, and proper tonearm alignment. Some times everything you need is already right under your nose, you just need someone to step in with a little know-how and tech finesse to properly setup your current gear bringing it back to its former glory.